Traveler Reviews for Private Tour in Kyoto, Japan by Tour Guide Tomoko H.
we are glad that we have availed this tour coz we have no clue where to start our Kyoto tour. The tour was more than what we expected. Tomoko-san made sure we covered what was in the itinerary despite our very slow pace. She is an amazing lady and a good photographer, too. Arigatou gozaimasu Tomoko-san. Tomoko is personable, knowledgeable, flexible and accommodating. She has an easy manner and is fun to be with. In summary, she created a great tour of the city. Tomoko was so lovely- on time, very easy to work with, and professional! This was our first visit to kyoto and she took us to a good mix of the can't miss spots and the hidden gems. We loved learning about the history and culture of the city from her, and we certainly wouldn't have experienced Kyoto as well as we did without her. Thank you Tomoko! Tomoko did a great job showing us around Kyoto. She is super knowledgeable about all of the local history and attractions, and knows her way around Kyoto and the surrounding areas. I'd definitely recommend her to anyone wanting to learn about Japanese culture! TOUR GUIDE RESPONSE: Dear Steven-san, Thank you very much for joining my tour and for your nice comment. I was happy to be with your nice family. I hope you will come back to Kyoto! Tomoko was a lovely guide. Knowledgeable, very accommodating and her communication on arrangements was clear. Enjoyed our tour, great restaurant recommendation upon parting! Our half day tour of Gion was stunning in the company of Tomoko in every way. She was very informative in the history of sites we visited and along the way we were shown speciality shops which are only in Kyoto and offer various food items, also shops specialising in Japanese decorative articles for the home. We finished off by going to a typical Kyoto restaurant (Japanese pizza)!! We will definitely recommend her. TOUR GUIDE RESPONSE: Dear Ali-san! Thank you very much for joining my tour and giving such a nice comment. I'm very glad you enjoyed our tour in Gion area. Yes, I do hope you will come back to Japan and Kyoto and see me again! Tomoko was fantastic. She made our memories of Japan so very special, her knowledge and information she shared was excellent. She went above and beyond to make sure we ticked all the boxes. She adjusted the itinerary to suit our changed requirements and we ate at the best tea houses and restuarant that made the whole experience incredible. She went at our pace and was so pleasant to chat with too. We are so happy she could be our guide. We had a very good tour with Tomoko. She was patient with us and provided us with stories and history around the sites we visited. TOUR GUIDE RESPONSE: Dear Heriberto-san, Thank you very much for joining my tour and giving me such a kind comment. I'm very glad that you enjoyed the tour with me. I had a hard time finding a guide prior to booking through Tours by Locals. After some trial and error, I found Tomoko. She was extremely responsive and answered my questions on how to get to Kyoto from Tokyo. During the trip, she was awesome! She knows so much history. She took me through the bustle and the quiet alleyways of Kyoto, which were equally beautiful. She was also extremely patient with me as I bought gifts and when I needed to rest due to my stomach virus. I would absolutely recommend Tomoko. TOUR GUIDE RESPONSE: Dear Jessica-san, Thank you for joining my tour and giving such a nice comment. I'm glad that you could enjoy Kyoto even though you were not in a good condition. I hope you could also enjoy Arashiyama bamboo forest and got back safely. Tomoko is great. She is knowledgeable and easy to be around. We did a half day tour and felt like we made the absolute most of 4 hours. She let us choose what to see and how long to be there, while suggesting things at the same time. We got hungry with an hour left and she was patient while we stopped for a snack. She gave plenty of advice and suggestions for our trip. Would tour with her again! TOUR GUIDE RESPONSE: Dear Anna-san, Thank you so much for your kind comments! I'm very happy that you enjoyed my half day tour. I enjoyed being with you, too. Thank you again for joining my tour! This was our family's first time in Kyoto and we had very little knowledge of the city and its sights and monuments. Tomoko promptly met us at the Hyatt Regency and proceeded to take us to Kiyomizu-Temple and the Gion district. Her pace and cadence were perfect. She seems to understand the clients' needs and we were provided just the right amount of information. She was also very respectful of what we wanted to see and take in. With two older teens, attention span is a challenge but we had a great time!! TOUR GUIDE RESPONSE: Dear Christine-san, Thank you very much for joining my tour and for such a kind comment. It was my pleasure to be with you and show you Kyoto's charms. I myself enjoyed being with your nice family. TOUR GUIDE RESPONSE: Dear Louis-san, Thank you for giving me a good rating. I hope you had a wonderful time and got good memories of Kyoto. Tomoko was a great guide and catered to our needs by being flexible in timing of the tour. It was enjoyable to have a true local guide to show us around Kyoto. TOUR GUIDE RESPONSE: Dear Alex-san, thank you very much for joining my tour and your kind comment. I'm very glad that you enjoyed the tour with me. I was happy to be with you. Thank you again. Tomoko was very flexible and adaptable in changing her planned itinerary, when we surprised her with the news that we'd already explored many of the sights by ourselves the previous day. She formulated a fantastic new itinerary, for which she was very informative in her commentary. Komoto was very friendly and engaging, and constantly volunteered interesting facts and amusing annecdotes. We had a wonderful time with Tomoko in Kyoto - filling every moment with just the right dose of interesting Information and guidance. The tour she put together for us was just of the perfect mixture allowing us to get a feel for the major sights and the wonderful city. What a perfect day. Thanks Tomo we can only recommend you ! TOUR GUIDE RESPONSE: Dear Christiane-san Thank you very much for your kind comment! I'm glad that you enjoyed my tour in Kyoto. It was my pleasure. I hope you will have another chance to come back to Kyoto! Tomo is a very nice and knowledgable guide, who helped us make the most of our very limited time in Kyoto. Highly recommended tiur to get a feel of old Kyoto. TOUR GUIDE RESPONSE: Dear Hugh-san, thank you so much for your kind comment! It was my pleasure to be your guide. I hope you could have wonderful time after we parted and fully enjoy this old and modern city. I hope you will come back to Kyoto and spend more time. Thank you! TOUR GUIDE RESPONSE: Dear Blake-san, thank you so much for your very kind comment! It was my pleasure to be your guide and I'm very happy that you enjoyed my tour. Thank you again for inviting me to such a gougeous dinner! I hope you will come back to Kyoto again in a different season! We had a very good time. When Tomoko arrived she helped us with a little translation with the owners or the ryokan. Then we completely changed the plan for the day and went to see the bamboo forest instead of sightseeing in town. She showed us the sights in the area and we had a very nice day. Her English was good and she was extremely willing to please us. TOUR GUIDE RESPONSE: Dear Tom-san, thank you very much for your kind comment! I'm very happy that you enjoyed the tour with me. Tomoko was awesome. She is very knowledgeable and passionate about Kyoto and its history. We saw some gorgeous scenery and the Kiyomizu dera temple was a beautiful and serene place, despite the crowds. Tomoko helped us taste and buy some lovely sweets and souvenirs. She was most patient and compassionate with my mothers slow walking pace. We would recommend Tomoko to anyone. She also has a gorgeous singing voice so if you tour with her see if she will sing for you it is a wonderful experience. TOUR GUIDE RESPONSE: Dear Linda-san, Thank you very much for your kind comment! It was my pleasure to guide you and your nice mother. I'm happy to hear that you enjoyed the places we visited and food you tasted. I hope you will come back to Japan again someday! Tomoko san gave us a lovely half-day tour of Arashiyama. She is charming, and the tour was well-adapted to our requests. TOUR GUIDE RESPONSE: Dear Ingrid-san, thank you for your comment. I'm glad that you enjoyed my half day tour. Thank you for joining my tour. We were able to get into a tour of the Katsura Imperial Villa due to Tomoko's quick thinking. She knows the ropes of Kyoto reservations. Excellent guide, highly reccommended. TOUR GUIDE RESPONSE: Dear David-san, that was because you are lucky people! I was glad you could enjoy the beautiful garden in Katsura Imperial Villa! Tomoko is a fantastic guide and I enjoyed my tour very much. Not only did we see some of the main sights but also some hidden gems along the way. Thank you Tomoko. TOUR GUIDE RESPONSE: Dear Simon-san, Thank you very much for your kind comment! It was my pleasure to be with you. I'm happy to hear that you enjoyed the tour with me. And you are a Kyoto fun, so I hope you will come back to Kyoto again soon! Tomoko put a lot of effort into giving us a broad view of Kyoto in a half-day (although she was very generous with her time too). We saw a lot, learned all about the geisha culture (which will stick with us), learned about some of the folklore such as the Temple with the balcony from which people used to jump for suicide, etc. It was a great introduction to Kyoto. She is very flexible as to what you want to accomplish. TOUR GUIDE RESPONSE: Dear Susan-san, Thank you very much for your kind comment. It was my pleasure to show you Kyoto's charm. From the stage of Kiyomizu-temple, people used to jump not for suicide, but they believed they could survive thanks to Kannon Budhist Diety. Excellent local knowledge. Friendly and engaging personality. TOUR GUIDE RESPONSE: Dear Robert-san, Thank you very much for your kind comment. I hope you enjoyed Nishiki food market and the afternoon, too. TOUR GUIDE RESPONSE: Mr. Kong ming Chan, thank you very much for let me being your guide and your nice rating! Tomoko was very professional and very accommodating to our needs. Her knowledge was excellent and her English was very good. In the short time we had we were able to see quite a lot . We would certainly use To tour again if were back in Kyoto and will definitely recommend her to our friends . TOUR GUIDE RESPONSE: Dear Ruth-san, thank you so much for your kind and so quick comment! I'm very happy that you enjoyed my tour and that you could see all the three places you wanted to. Please take a good rest because you were in such heat! If I can see you again in Kyoto, I'll be very happy. TOUR GUIDE RESPONSE: Dear Hemant san, thank you very much for your kind comment and high rating of the tours. I'm very happy that you enjoyed your Kyoto tours with me and my singing. When you come back to Kyoto in spring or fall, I'd love to be your guide and show you other attractive parts of Kyoto. Tomoko was a great company and guide through Nara. We had fun with the deer and great learing experience of Kyoto and Nara history, will defenitly go back and sure will be with her. TOUR GUIDE RESPONSE: Dear Juan-san, thank you very much for your kind comment again! I'll be waiting for your return to Japan!! We had a wonderful day touring Kyoto with Tomoko. She is extremely knowledgable, entertaining and speaks excellent English. We will always remember our day with her in this amazing city. TOUR GUIDE RESPONSE: Dear Jack-san, thank you for your kind comment. It was my pleasure to be your guide. The tour with you is a wonderful memory to me, too! I hope you enjoyed Miyako Odori (the dance show in Gion) today. Tomoko was able to arrange a special tea ceremony experience that was definitely the high point of my stay here in Kyoto. She is very knowledgable on this subject and able to converse thoughtfully. I recommend arranging private tours and tailoring the itinerary to your interests. 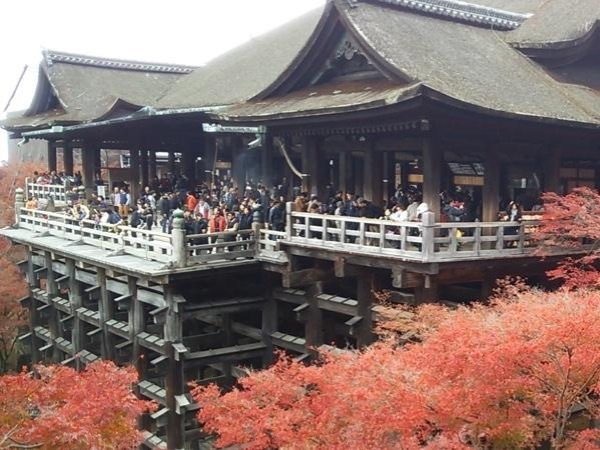 Tomoko is an adaptable guide who can work to help you get more out of a visit to Kyoto than just ticking off the list of crowded 'must see' sites. TOUR GUIDE RESPONSE: Robert san, Thank you very much for your kind comment! It was really wonderful 'ichigo ichie'(once in a lifetime encounter) in the tea ceremony. I appreciate the 'goen' with you! TOUR GUIDE RESPONSE: Susan san, Thank you very much for your kind comment! I was glad that you could arrive in time I could show you some atractive parts of Kyoto. And I was happy to be with your nice family! Please come back to Kyoto again someday! Thank you. We had a really great time. Definitely we would not been able to see everything by ourselves. Tomoko-san made our half day tour feel like a full day! Ok, here is the difference, there were a zillion elementary to JrHS students in massive groups but Tomoko-san maneuvered us like water flowing around stones. We walked though the off beated road where I felt samurai once walked or escorting Gei-ko (ok, I got carried away but hey, I felt it was!) thru the 2 story houses. Kyoto is dreamy. Tomoko, thank you! TOUR GUIDE RESPONSE: Kung san, thank you so much for your kind comment! It was my pleasure that you enjoyed the half day tour. I myself enjoyed being with you and you told me interesting stories I didn't know! Kyoto has a lot of charms which cannot be seen from the surface. I hope you will enjoy the western part of Kyoto with Akie san today. I have a jazz gig tonight at a jazz bar called Greenwich House If you have time and energy to go out in the evening, please drop in. Thank you again! We appreciated Tomoko's knowledge and enthusiasm about Japanese culture and Kyoto traditions. Tomoko was extremely helpful in meeting all of our requests. TOUR GUIDE RESPONSE: Andy san, thank you so much for your kind and prompt feedback. I'm very happy to hear that I could be helpful in meeting your requests. I hope you will fully enjoy the rest of your travel. TOUR GUIDE RESPONSE: Dear Benoit san, thank you very much for your kind feedback on our tour. It was a terribly hot day! I'm really happy that we could survive with several things (our life savers)! I myself really enjoyed the tour with you. Thank you for choosing me as your guide. Thank you for your suggestion, too. I will send my client a massage including a checklist of items to bring. I'll be very very happy if I can meet you again.